With Mother’s day quickly approaching it would make sense that we would all be scrambling around for that perfect gift to give our moms. While you could buy her a gift, I’m sure that we’ve all figured out by now that one of the best things to do for our moms is to make her something. Even if we’re adults, there’s always that spot in our mom’s hearts that will be reserved for the love of our crafts that we produce. So we’re here to help you with an idea that may not only save you from wracking your brain to giving a gift but make you mom a tearful thank you. Once you’ve completed the entire look and let everything set and dry, you can write in the card to your heart’s content. The fun thing about using a blank card is how much room you have to write exactly what you feel. You don’t have to let the card do the talking for you, because this is all coming from you. Once you’re all done, seal it in an envelope and mail it off. Or have the pleasure of giving it to her yourself. Either way, she’ll love it when you give it to her. 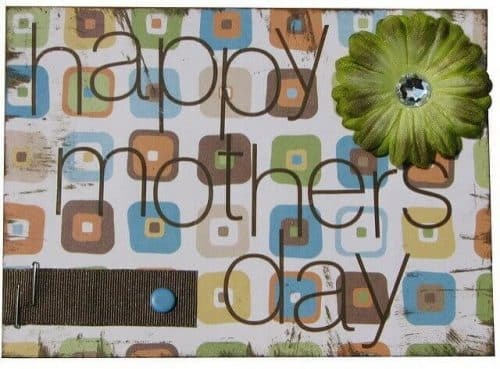 Hope you have a Happy Mother’s Day to all the moms out there and good luck to all your crafts!